Electrically welded side seam, with ends double seamed and solutioned. Reduced ends for interstacking on 279.4mm and 355.6mm diameters. Strap handle on head or wire drop on body. Electrically welded side seam, with ends double seamed and solutioned. Reduced ends for interstacking on 11" and 14" diameters. We offer a wide choice with eight different diameters and a range of capacities from 5 to 63 litres, there are also 6 different types of head fitting to choose from. 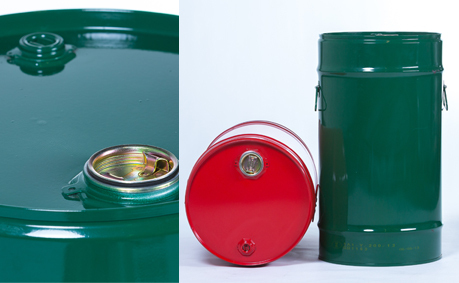 280mm (11”) and 356mm (14”) diameter drums can be also be made with reduced bottoms for interstacking.